welcome in the #5 Devlog of I’m Joshua, the First episode that we release this year. The Devlog of today is fully dedicated to the voices of the 24 characters available in I’m Joshua. 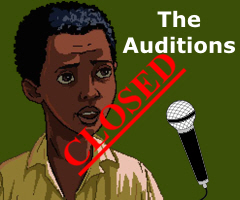 The 16th February we have started the game auditions, they are expired two weeks ago. First of all we wish to send a special thanks to the VOC (Voice Acting Club), because is a fantastic forum where you can meet many voice talents from all over the world. 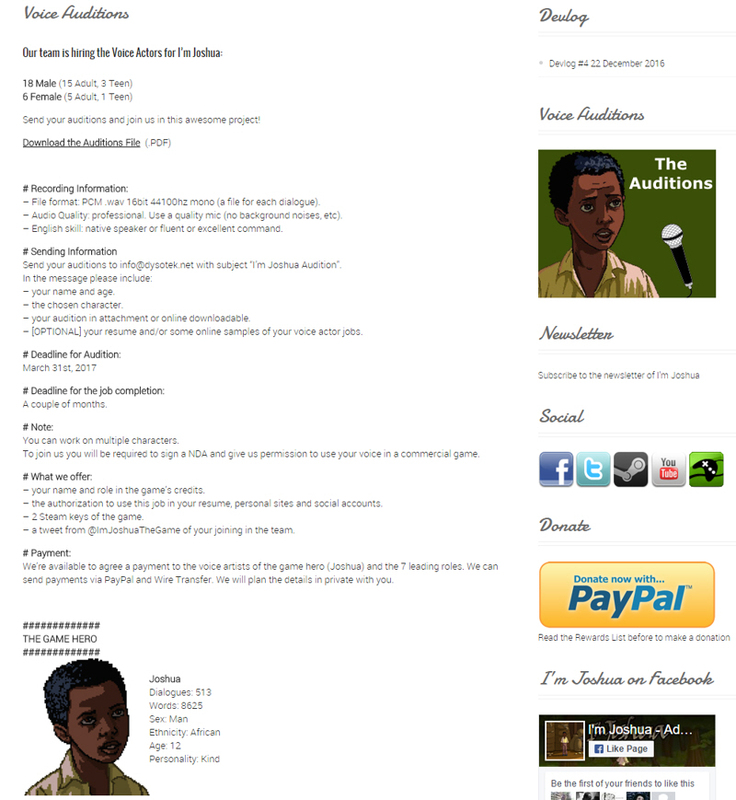 In 6 weeks we got auditions from over 70 voice actors! We are very satisfied of this impressive result and for the good feedback received for I’m Joshua. The female role most requested has been Rebecca Gallaway, with 18 auditions got; regarding the male role we got 25 and 24 auditions for Jacob and Harold Gallaway. welcome in the #4 Devlog of I’m Joshua! We’re sorry that you have waited so long to read this post. To forgive us today we release our biggest Devlog! – Highlight: placing the mouse over an item, appear the name and a curved arrow (it starts from the name and end to the item). – Inspection: clicking the item appear the full screen image and the description. From the inspection page you can add the item to the inventory or go back to the previous scene. – Pick: add the item to the inventory, removing it from the scene and the inspection page. – Drop: drop the item from the inventory, adding it again to the scene and the inspection page. – Use: try to use the item as requested from the game. welcome in the #3 Devlog of I’m Joshua! 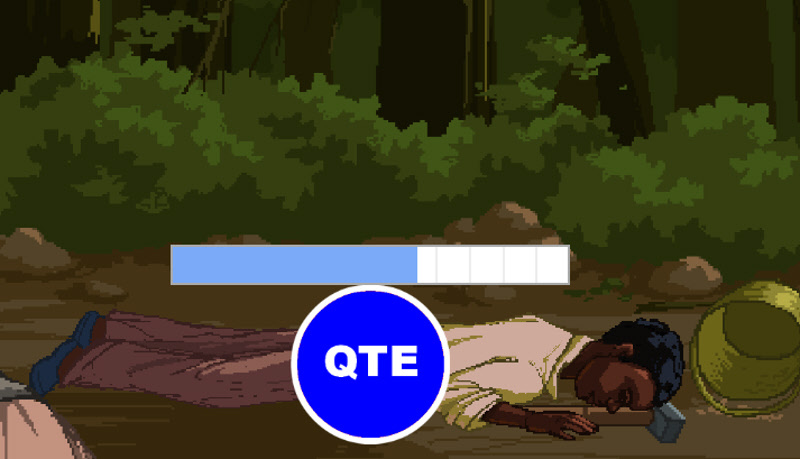 Today we talk about the current status of two main functions of the game: the quick time events and the items. The game plot has been completed months ago, at the moment we are polishing it a little bit. A game function allows us to quickly load a CSV file with the whole dialog texts. The same function will manage also the multilanguage system, that we will add in the next months. As you know this is the First of the three chapters of I’m Joshua that will be released through the following years. This means that we have to develop all the main functions of the game: dialog system, multilanguage, menu, GUI, global variables, quick time events, items inventory, and much more. In adding there is the huge effort regarding the making of the: animations, cutscenes, audio production and more. It’s a true challenge! But we’re working on this project with great passion, hoping to do a good job. 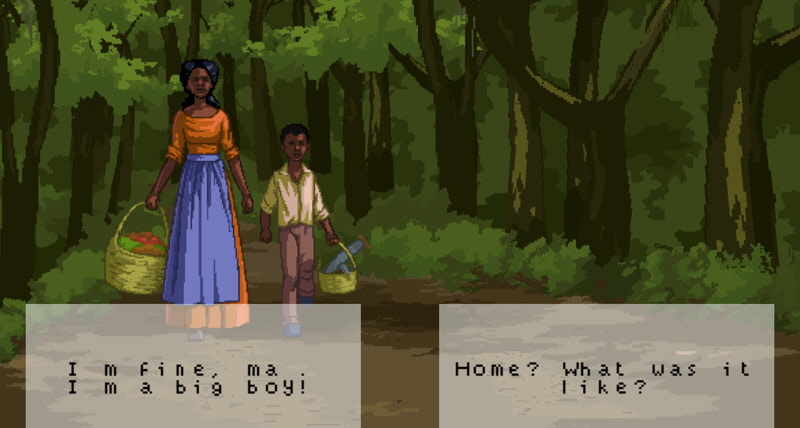 I'm Joshua – Adventure Game in Pixel Art about Slavery in the United States. Copyright © 2015. I'm Joshua is an Indie production developed and published by Dysotek® (Italy). I'm Joshua® and Dysotek® are registered trademarks of Dysotek in the U.S. and/or other countries. All rights reserved.